If you have a multiple list account, you can use your own domain to replace simplelists.com. 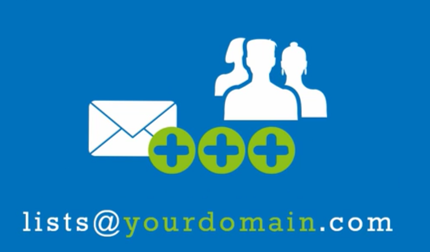 In fact, you can add as many domains as you like, which means you can totally brand the system as your own. Combine using your own domain with branding your landing pages for truly professional results. This short post will explain how to use your own domain and, once you have done this, how to improve the deliverability of your emails. Setting up your own domain is easy. Log in to your Simplelists multiple list account, navigate to ‘General Settings’ in the left-hand menu and select the ‘Domains’ tab. Enter your domain name and click ‘Add’. In the list that follows, set your domain name as ‘primary’. You can then view your new email addresses on the ‘List members’ page in the left-hand menu. Once your domain name is added, you must configure its mail exchange records, using your web hosting control panel. Set the Primary MX record to ‘mx1.simplelists.com’ and the Secondary to ‘mx2.simplelists.com’. You can see instructions for how to do this using cPanel in this short video. Note that it can take up to 72 hours for the MX changes to come into effect, depending on your web hosting settings. There are some simple steps that you can take to improve the deliverability of your emails. SPF records prevent spammers from sending messages with forged email addresses from your domain. DKIM records help to verify the sender and prove that a message has not been altered in transit. If you are using your own domain, it is recommended that you add both of these DNS records to your domain. When logged into Simplelists with your multiple list account selected, navigate to ‘General Settings’ and the ‘Domains’ tab. Scroll down to find the details you’ll need to add the DNS records. You can then open your web hosting control panel and complete the required fields for the SPF and DKIM records. You can see instructions for how to do this using cPanel in this short video. All of these instructions can be viewed in two short videos on a previous post on our blog.